This style is very quick and easy to do. I did two jumbo flat twists going upwards and made my usual fringe/pomp at the front and voila! 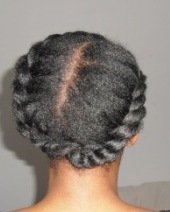 An elegant natural hair style suitable for all occasions.